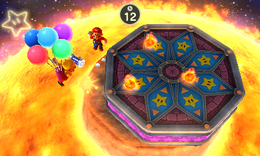 Heat Stroke is a 1-vs-3 minigame found in Mario Party 5, and returns in Mario Party: The Top 100. The name comes from the medical condition, in which someone's body temperature is dangerously high. 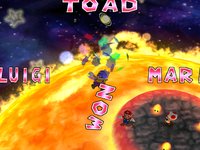 The camera pans in on the area of the minigame, which is on a sun. The trio drops in on the tower and the minigame begins. The solo player (who is suspended with balloons tied around their body in order to be held up from and avoid getting into the sun.) is given a hammer which is to be used to knock the platforms away, one at a time. When the solo player knocks a platform away, the trio must jump to avoid going offscreen with it and out of the minigame. The solo player can also fake the swing, tricking the team members into jumping too soon. Over time, Lava Bubbles fall, knocking out any team member who touches them. The solo player wins if they knock out all the three team players; but the three team players all win if any survive for 30 seconds and/or get to the final platform. The player who knocked the team off waves at the screen. 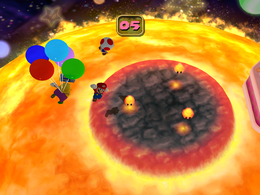 The solo player's balloons pop, making them fall and get burned by the sun while those of the team of three that are left remaining perform their winning poses. Rules – "One player tries to knock the other three off the blocks, while the other three must jump to avoid being knocked off." Advice 1 – "The player with the hammer can try to fake out the other players by pressing ." Advice 2 – "The three players must also watch out for the falling Podoboos." Description – "When the player with the hammer strikes, don't get caught flat-footed!" On-screen (Solo) – "Send your rivals flying!" On-screen (Team) – "Jump to avoid getting sent flying!" This page was last edited on August 4, 2018, at 09:28.